I'm a freaking skunk. And tonight, I'm live blogging Halloween 2014 IN THE RAIN. 7:16pm: Guys and ghouls, you may not know this but Swedish Fish are the next big thing. A black kitten and a teddy bear both declared, "I got a whole package of Swedish Fish. A whole package!" A whole package, according to the minion, contains like 5 swedish fish. 7:09 pm: A blue fairy has a deep discussion with the minion. Minion: Hi! Which one do you want? Minion: *points at lollipop* This one? M: *points at Smarties* This one? M: *points at nerds* This one? M: *points at sour patch kids* This one? Everyone is happy. Except me, because blue fairy didn't pick me. 6:59 pm: Zombie police officer did not arrest me for smelling bad. She didn't eat me, either. 6:48 pm: So far the most hilarious part of Halloween 2014 is the puddle in front of the minion's house. Many children have faced the puddle and have failed to successfully cross the puddle. I applaud the puddle. 6:27 pm: Guys and gals, ghosts and ghouls, this is possibly the most boring Halloween ever!! Usually by now th...oh wait, hold on. Okay, a cowboy just told my human minion (in a high pitched timbre), "You have a PUDDLE in your driveway. DID YOU KNOW THIS? You should do something about it." Haha, minion got schooled! 6:13 pm: An oversized superman toddler declared I was a DOG in a high-pitched squeal. I agreed. Then his mom kept telling him not to jump in puddles, "No! No! No puddles!" I agreed. 5:54 pm: Everyone wears masks. No one pets me. This is a day of great mourning and sads for me. 5:45 pm: No one pet me this time. NO ONE. What is wrong with these kids? Also it took a ghost 25 seconds to decide between pink nerd and purple ones. Then he grabbed the pink ones and said "purple!" Was he colorblind? 5:08: Four adorable kids arrived. I mean, I guess only three were adorable. One didn't even acknowledge my presence so obviously something wrong with him. The little princess proclaimed me a SKUNK! and then pat me on the head. That was cool. Leading environmental organizations continue to ignore one of the largest contributors to rain forest destruction, water and air pollution, desertification, climate change...why? 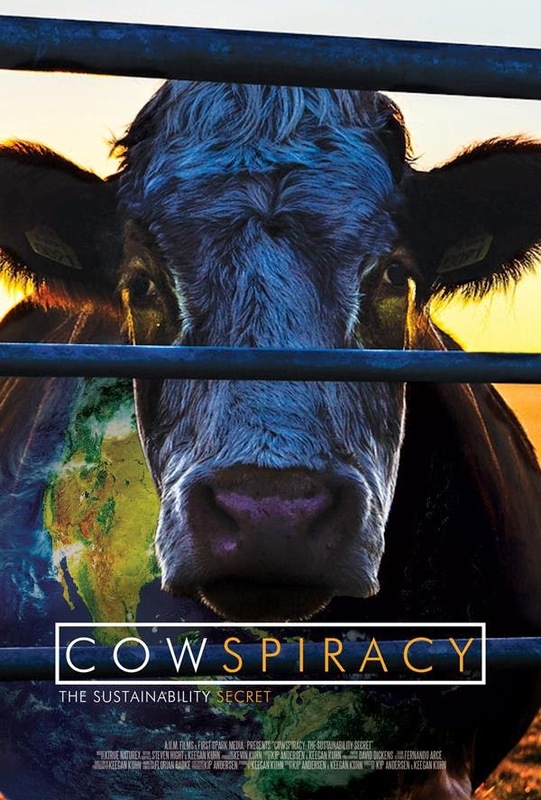 Find out why by supporting efforts to release the ground-breaking documentary Cowspiracy to a wider audience! Consider contributing to the campaign to get Cowspiracy to a wider audience! Have you ever wondered if your dog is obsessed with fashion scarves? Probably not. 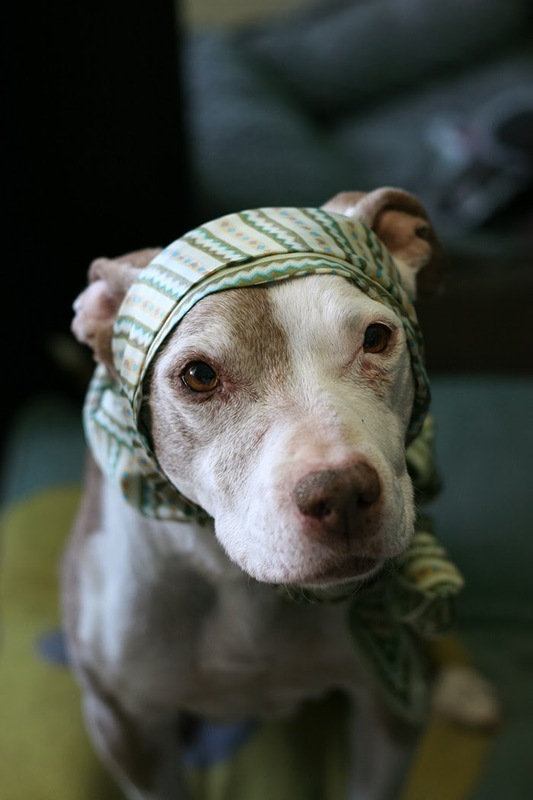 But if you have, here are three signs indicating your dog's love affair with scarves. These could be signs for celebration or an intervention. You decide. It's never enough to wear a scarf in one manner, a truly scarf-obsessed canine enjoys a variety of styles with her scarf. For example, Mina uses a fancy knot looped around her neck in one shot, then brings that sucker up over her head in the next. One, a dapper scarf for a jaunt around town. Two, concussion treatment? A dog who loves scarves knows to project the emotional intent behind the scarf. 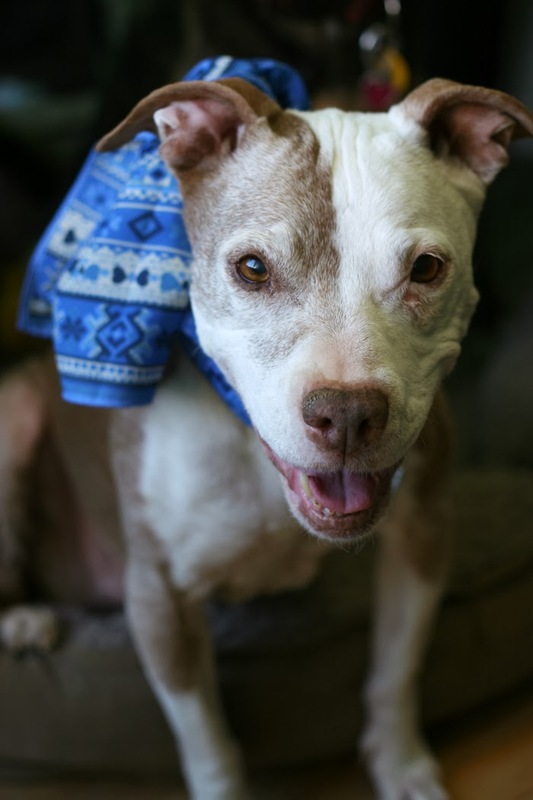 Mina understands this blue bandana in a puffed up bow warrants a big 'ol Pit Bull smile. This is not a serious scarf, this is a drive-with-the-top-down scarf. The self-respecting scarf-loving canine has certain expectations when it comes to the final product, including a mandatory B&W version. Mina is either channeling her inner Audrey Hepburn or someone's grandmother. Whether Mina loves scarves is debatable. She loves me. She loves cookies. So the combination of the two certainly creates an atmosphere in which wearing a scarf is the least of Mina's concerns. I think Mina appreciates being the center of attention too. Scarves give her that platform. Mina wishes all dogs could wear scarves, but her sister Celeste disagrees...she'll be featured soon with 3 Signs Your Dog Hates Wearing Scarves. Stay tuned. Can you summon words for those ears? I have seen those ears for nearly seven years. They looked the same in puppy form. Celeste suffered from severe ear infections the majority of her life, leaving her sensitive about ear-touches. Sometimes I accidentally elicit a squeak from her if I handle her ears the wrong way. Even during her darkest moments, her ears scabbed and painful, Celeste would let me tend to them. Her ears are what the velveteen rabbit would feel like. Dog ears are like that but Celeste's especially so. True story time. Two years ago, Celeste fancied herself a war mage. Sighting her quarry - a jackrabbit - Celeste tried her Barbed-Wire-Be-Gone spell and misfired, crashing wildly into the jagged metal. Unperturbed, Celeste only ceased her pursuit because of my panicked screams. Then she insisted on walking the two miles back to the car, despite my attempts at carrying her. The wounds were clean and so bled profusely, inspiring a deep fear of blood loss and imminent death. In me, not her. She needed ten stitches to her chest and four stitches to her paw. She was cool with the pain meds. She still chases rabbits but is more responsible around barbed wire. I am grateful her ears were left untouched. They are perfectly wild. Everything with dignity. This is Mina's motto. Primarily because I inflict many indignities upon her. For example, The Year of the Scarf. Some may think she looks grandmotherly in this photo. Untrue. Mina is ready for a convertible ride down to a beach where she may fling her front paws dangerously in salt water. 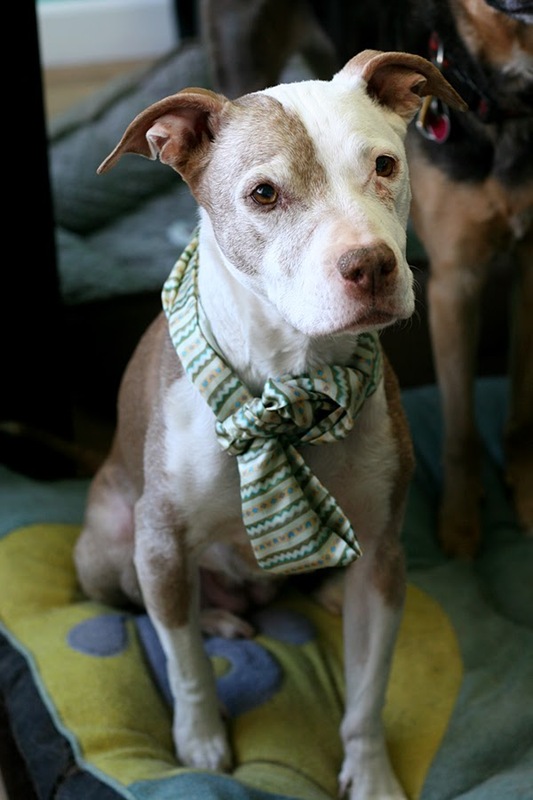 Senior Mina carries an air of dignity and cuteness with her at all times. A fine line to walk, for sure. Junior Mina never did. She was a rolling, frothing, bowling mass of muscle and thoughtless intent. My dad likes to share a story of walking Mina at the local park years ago. She weighed 48 pounds. He had a black belt in karate. And she dragged him down a hill. I think there was another uncontrollable dog with a mirthful guardian. Nothing bad happened. Another true story. Junior Mina had a hard head. Senior Mina has the same hard head but uses it appropriately. Junior Mina believed all creatures had heads like cement. She greeted me daily with a leap to my face, her rock-solid cranium crashing into my less rock-solid face. One bloody nose and black eye later, I devised a strategy. Before leaving for college classes, I would steal with me one of Mina's favorite toys (she had more than one). This was not so traumatic for Mina, thankfully. Upon my return, I would offer the sacrificial squeaky toy in lieu of my face. Mina loved this game. Her favorite toy AND person showing up at the same time? Nice! To this day, Mina greets my return home with a squeaky toy in mouth and a happy grin on her face. I don't know about this, guys and gals. Mina is included in this photograph as a small right ear in the bottom left corner. Celeste turns seven in May. I adopted her as a puppy from the streets of Mexico. Literally, the streets of Mexico presented me with an adoption contract and I signed on the dotted lines. If only. 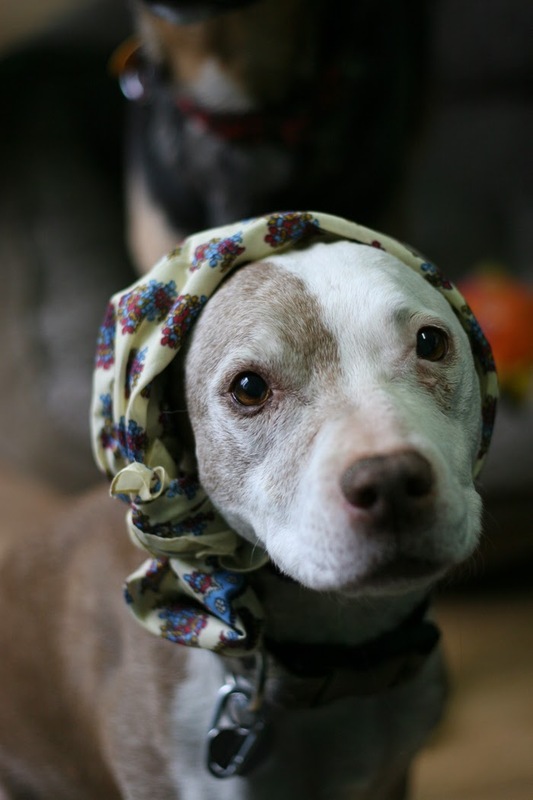 Dogs accept punishment (scarves, e.g.) for cookies. Celeste prefers an off limit approach to her ears but for a cookie? Wrap a scarf around her head stat! She did not paw or shake or generally act horrified. Instead, she stared with great intensity at the cookie which is located two inches above the camera. I wanted you to believe she loves cameras. She does not. Cookies make cameras appealing. This is one reason why dogs are great. Wearing scarves is another. Rampaging across a meadow in glee is an additional one. The Year of the Scarf.